OMG ZOMBIES ARE CHASING ME! Well, they will be on August 4. After much talking about it, I have finally got around to officially registering for the Run for Your Lives zombie obstacle course race, being held about halfway between Seattle & Portland on the August long weekend. Special props go out to Dr. Erika, who brought this race to my attention! I’ve joined my friend Julie’s team – the Apocalyptic Avengers. And I’m taking costume suggestions1. 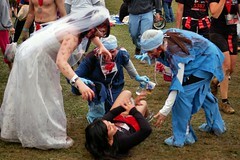 Image from the Darlington, MD Zombie Race in 2011, posted by Rob Swatski on Flickr.